Dejan Zlaticanin blasted late-replacement Mamani with a third round TKO (:54) to win the vacant WBC Lightweight World Championship. The 32-year-old Zlaticanin (18-0, 10 KOs) became the first native of the Southeastern European country of Montenegro to capture a world championship. 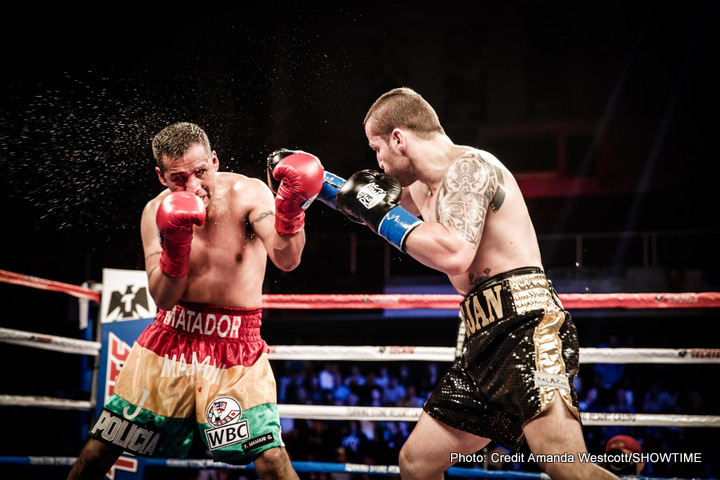 The southpaw Zlaticanin pounced with a powerful straight left that had Mamani in trouble just seconds into the fight. The Bolivian, who was also aiming to become the first native of his homeland to win a title, survived the round but he was in trouble again in the third. Zlaticanin staggered with an overhand left and followed with a series of unanswered blows that forced referee Charlie Fitch to halt the contest with Mamani (21-3-1, 12 KOs) defenseless against the ropes. “I knew that I would knock him out. He stood too close to me. After the fight, Zlaticanin called out Jorge Linares, the WBC Lightweight “Champion in Recess”, who pulled out of a tentatively scheduled match with Zlaticanin due to an injury. “I want Linares next. He can’t run from me anymore.